What is a data buoy? Have you seen a large metal instrument, similar to the picture on the right, floating in the ocean and wondered what that device could be? What you have seen is a buoy (pronounced: boo-ee). A data buoy contains sensors used to monitor and collect atmospheric and oceanographic conditions. The sensors and the solar panels (used as a power source) distinguish a data buoy from other buoys. They also allow collected data to be converted into an electronic signal and transmitted to shore or logged in the onboard data unit. 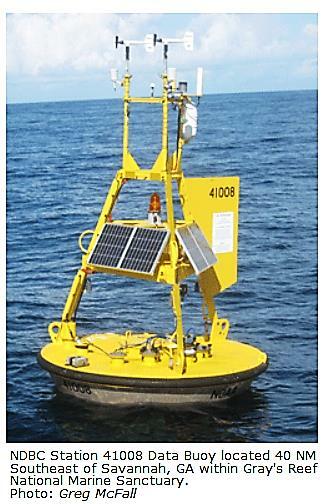 Despite its simplistic design, data buoys are used in a variety of applications. Real time sensors provide the capability for early detection, monitoring, and forecasting of weather occurrences and human activity. These sensors are extremely capable of measuring sea level changes less than a millimeter in the ocean. The enclosure of a data buoy is designed to support, protect and power a number of sensors of different modalities. The amount and type of sensors placed on the buoy vary based on application. How does a data buoy work? A typical data buoy consists of two main components that contain sensory components; the base and the tower. CLICK HERE to learn more about our Barometric products.